View larger. | Exoplanet Beta Pictoris b moving around its parent star, from December 2014 until it disappeared into the star’s glare in late 2016. Then, 2 years later, astronomers saw it re-emerge on the other side of its star. Notice the planet’s position in the bottom right image, in contrast to the others! Image via ESO/Lagrange/SPHERE consortium. ESO has also created a timelapse video from these images, which you can see here. Enjoy! 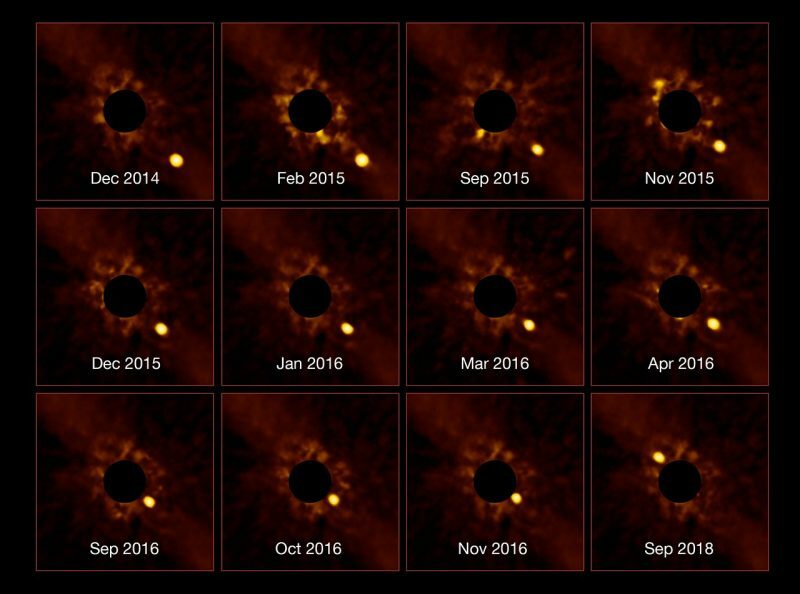 Bottom line: Stunning new sequence of images from ESO’s SPHERE instrument, showing the passage of exoplanet Beta Pictoris b into the glare of its star and then, two years later, re-emerging.